Swarovski crystal components, sterling silver and Sheila’s handmade beads form this tiered necklace. All wire work was hand done by Sheila. 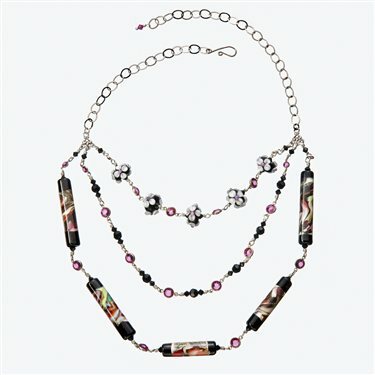 Adjustable necklace length measures 18” – 22” around the top strand. Glass beads are created in the flame of a torch and fully kiln annealed.